This post was inspired by a conversation I had with a friend (who shall remain nameless) a few days ago. This friend was telling me about a salad she had at a local restaurant which was, according to her, the best salad in the world. I was obviously intrigued. She told me the salad consisted of roasted vegetables atop baby spinach with balsamic dressing and feta cheese. Immediately I’m thinking, “mmmm, that would be even better with goat cheese. Wait, no, pan fried, breaded goat cheese…”. I digress. But I’ll be posting THAT recipe shortly. You can whisk all the ingredients together really well or put them in a bottle and shake the heck out of them. I actually blend everything in my 2-cup food processor and it stays nice and emulsified. The choice is yours. This dressing will keep longer than it will remain in your fridge. 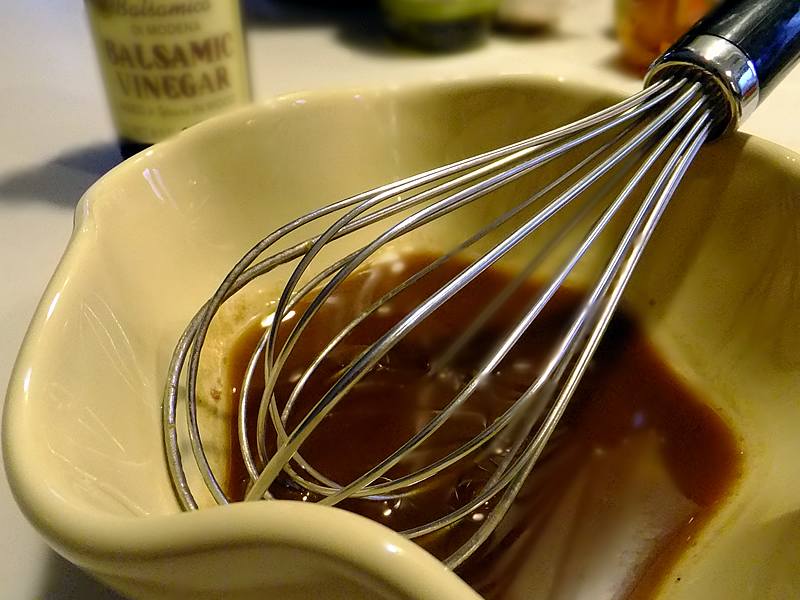 Friends don't let friends buy bottled balsamic dressing. This sounds really good and I shall try it. You are quite the chef these days! Good for you. Your gram is smiling! But I think she got it from her Aunt! I am making it for dinner. Let you know how it comes. It amazes me how many people think making salad dressing is rocket science! I love you for recreating this for your friend! It’s exactly what I would of done. And looks absolutely delicious! You are so right! Making your own salad dressing is a no-brainer! 🙂 I haven’t bought salad dressing in decades, and I make my own vinegars which provides lots of variety. Good for you for educating your friend on how easy it is to do and for starting with such a tasty, tasty dressing! The dressing was great. I will back off a bit on the balsamic next time, but the whole salad was wonderful. I am not usually the salad maker in the house, but I did this one. It looked so pretty. I used red pepper,tomato, eggplant, onion, garlic, and mushrooms for the roasted veggies. I roasted them in olive oil for about 30 minutes. I used spinach and arugula for the greens. And lots of Feta Cheese on top of the veggies. I didn’t toss it, just drizzled the dressing over the top. Definitely on the menu at our house. Went very will with a steak we grilled.